Whenever I�m down I read your website to lighten my mood. Goldens always make me smile � especially my 11.5 year old Bailey! Here�s to helping you do more for the best breed in the world! Thanks so much for your donation and kind words! Goldens do have a way of bringing out the best in us. Please give Bailey a hug for us, and thanks again for thinking of us. Just wanted to give you a 2-week update on Eli. He�s doing great! It�s like he�s been here for 2 years rather than 2 weeks. We�ve had fun playing with Eli in our backyard on sunny days and we�ve learned that Eli loves to play catch with his ball in the rain. He is having a good time getting lots of love and attention from us, and we love how affectionate and gentle he is with us. He�s a real sweetie and we just wanted to thank you for letting our home be his forever home. Attached is a picture of our daughter, Jordan, with Eli. He�s been great with both of our kids and they�ve been great with him too. Eli looks great! It sounds as if he�s where he was meant to be, and we appreciate your opening your home and your hearts to him. Keep sending those pictures, and tell Eli to come on in out of the rain! Just wanted to let you know that my new shadow �Glenda� is wonderful. She is an amazing match for our family. So loving, happy, and gentle. Thanks for finding us such a great addition to our family. We love Glenda so much. Lucky Glenda for finding you and your family! As much as we appreciate your note, it�s you that should be thanked for giving Glenda the chance for a happy life where she is cherished and loved. Please keep in touch and let us know how she�s doing, and of course, send pictures! It was your good work that made him so easy to adopt. You have had so many good ideas that have helped make this process easy. He is truly a gentleman on the leash with the gentle leader and he learned that from you. The dinner thing is like a miracle although he still gets very excited about food; at least we can all eat in peace. We have the easy part: a great, fun dog to love. Your part is very hard and essential to take a badly cared for dog and turn him into a ready-to-adopt love. We thank you every day for taking the time with us and with Gialla. Amber is not so thrilled. They have not had any sharp words, she just kind of ignores him. He is a handful to ignore as he pushes past her to get his share of pats. He certainly keeps her entertained but she would prefer to be left alone to sleep her day away. They are beginning to sleep closer to one another, and I think we are on our way to a friendlier coexistence. He continues to make overtures to her, she just does not return the affection yet. However, as long as they are not fighting and both are eating, walking, and playing as usual, that�s fine with us. Thanks for writing! Your point about how hard our foster homes work to get �their� dogs ready for a forever home is exactly right, but we can also tell you that there is no better reward for that work than knowing that a dog is safe, loved, and truly a part of a family. Thank you for making that possible for Gialla. Give Amber some time, and hopefully she and Gialla will become the best of buddies. Sometimes it happens almost right away, and other times it takes a while for the dogs to sort out the new dynamics of the situation. When Amber is ready, you�ll know it! We�d love to see pictures of the two of them sometime. I just received my Summer 2006 newsletter and was pleased to be reminded of the interview I had prior to being rewarded with blessed Benjamin. He was with me until he was fifteen when he died very quietly. There were several sad months until Linda Schnorrbusch called and I was rewarded with Sunny (formerly known as Copper Sunset). He�s now twelve, almost thirteen, and gives pleasure to everyone who meets him. He tolerates my hollering during the Giants games (although the Giants/Eagles game had him dialing 911) and the vet says he�s in good health. If anyone has doubts about adopting an older dog, please use my name as a referent. I can vouch for the seniors with great joy. Poor Sunny! � we think there�s going to be lots of reasons for hollering at the Giants this season! 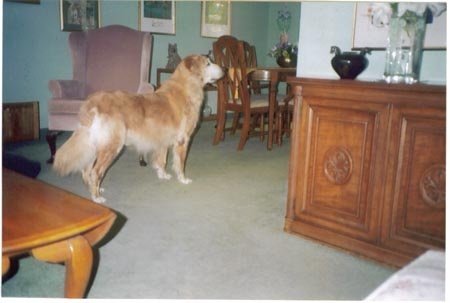 Your willingness to welcome senior Goldens into your home and your life is especially treasured; although it is inevitable that their time with us is shorter than we�d like, the quality of each day we have with these old souls is easily worth that sacrifice. Like Benjamin before him, Sunny is no doubt wondering why it took so long for him to find you and enjoy the best days of his life. Thank you. Just wanted to let you know that Tyler, as we are calling him, is doing great. He has fit into the family and our routine so great. Toby and him get along super. They play outside together and then come in exhausted. We are so happy that we have him. John is working with him on training, but it is slow going. Tyler is stubborn. While reading over his papers, I found that his date of birth was September 19, 2002. So he will be 4 come September. This was on the paperwork from the vet. He is doing well with the allergies; not as bad as I thought. I made them home made dog biscuits and they just love them. It was if they knew I was baking for them, they laid right in the kitchen as I was doing it. How are your dogs doing? Have they adjusted from Tyler leaving? Well, take care, and just wanted to give you an update. See you at the reunion. We�re so glad to know that Tyler is doing so well! And what lucky dogs to get homemade dog biscuits! Now of course they�ll want to be with you all the time in the kitchen just in case you�re whipping up something special for them again. Good luck with the training; persistence seems to be the key there! Please keep in touch to let us know how Tyler is doing. 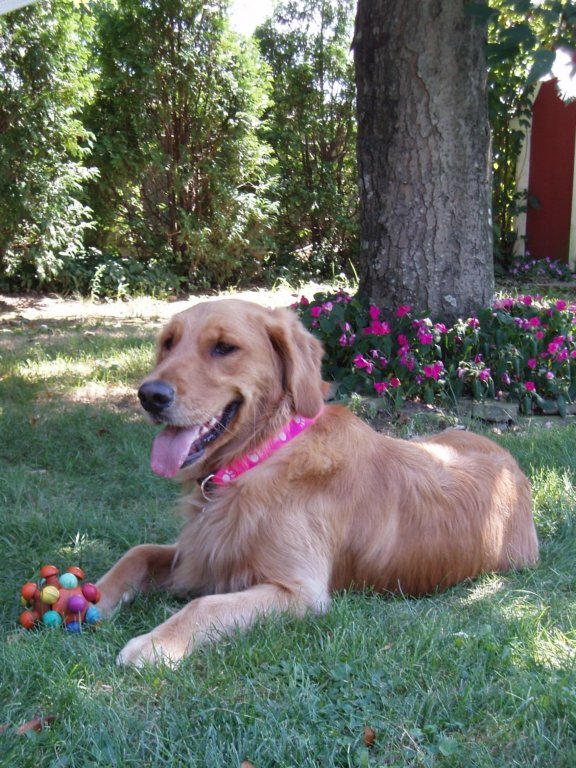 It�s been a very long time since I last wrote, but I found your email address and figured I could certainly send you an update on the wonderful golden girl I adopted from you in March. She�s a dear! Still counter-surfing when given the chance, and she eats more socks than the dryer, but all in all, she�s a sweetheart and we love her. Ten days after I brought her home. We headed off to obedience school, where she was the start of the class (also 5+ years older than any of the other students!) I�m still unable to let her off-leash on our walks in the park across the street, as she has escaped a few times and just takes off. Yesterday, however, I found the new Dog Park in South Mountain Reservation, and we all (Annie too) spent over an hour playing with a good-sized group of dogs. My two seemed to love it, so I think I�ll try to make the 20-minute drive a few times a week if possible. It�s good for them to be able to really run! Otherwise, it�s either my back yard, or controlled, leashed walks in Grover Cleveland, which they both love. Hope you guys are doing well. How�s Trinity? Have you fostered any others? If my house were bigger I would definitely think of fostering. These girls are such a big part of my family! My son was living in NJ for a while this summer, and he and Carrie developed a wonderful bond. He wanted to take her with him when he moved back to Vermont last week (I wouldn�t let her go!). I�d still love to meet up one of these days. If you�re up to a trek to South Mountain, let me know and we can get the girls together. Thanks for writing! We�re glad that Carrie is doing so well. The South Mountain dog park is a great facility, and your dogs are lucky to be able to run off some steam and socialize there! It�s terrific that you�ve gone with her to obedience school; must be fun to be the star of the class and show all those puppies what they can aspire to. Please send pictures when you have a chance, and thank you again for welcoming Carrie to your family. I am sorry that I have not got back to you sooner. My Mom and Dad have been busy, and I don�t know how to turn this thing on. Anyway, I have been good. I went to the vet earlier this week. I do have a slight UT infection, and the doctor did tell Mom and Dad to get me to lose a little weight. Otherwise, she said everything else looks good (knock wood). Mom and Dad take me into Clinton for my walks, and I have a great time, looking at the waterfall and meeting other dogs. Up to my last vet visit, we all would go to the ice cream store, and I�d get my own baby size cup of vanilla. But I guess those days are over for a while. I actually am coming on September 30, and I hope it�s OK for Mom and Dad to come too! I promise they won�t eat too much. Speaking of which, GRRI�s site seems to be down and I don�t know where the form is; could you relay to Shayne that we will be there on the 30th. I sure can�t wait to see all my other brethren at the reunion, and I sure want to see my foster Mom again, who did such a great job nursing me back to health. Mom and Dad still talk about what you did for me to this day! So let the folks at GRRI know I will be there. See you on the 30th! It was great to see you at reunion; you�re looking terrific! You�re a perfect example of what makes it all worthwhile for our foster homes: in your case, our volunteer�s diligent care and love got you ready to be where you should be, right at home with your Mom and Dad. To see you looking so happy and healthy is the perfect reward for that work. Sorry to hear that your new diet doesn�t include ice cream, but by next summer you�ll be slim and trim and ready for the occasional treat! Please keep in touch; Maybe Santa will bring you some thumbs so you can work the computer by yourself. Hope all is well. Just wanted to let you know that today Kip turned 8 and is enjoying his day. He is now 87 pounds and it is much easier on his joints. We love him so. We will forward a picture. We love the picture of Kip on his birthday! Congratulations on being so successful in helping him lose weight. Kip looks very content and happy, and we�re grateful to you for giving him such a great home. Send more pictures! It is with great sadness that I write to you. 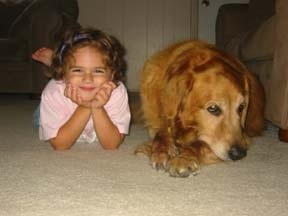 Rusty died last Tuesday. He was just turning 15 which I know is a blessing but it is just never long enough. Thank you for uniting us and giving us the most wonderful years together! We�re so sorry to hear of Rusty�s passing. As much as you miss him, we hope you�ll also take comfort in the knowledge that he was so happy and had a wonderful life with you and Rich. Our hope is that every dog we work with is lucky enough to find such a caring, loving home as yours. Our thoughts are with you. I have been meaning to write to you about Penny but have been pretty busy making changes around here to accommodate her. Penny has made an excellent transition to our home and lifestyle. She is doing really well with Gus, my senior/rescue Golden and also with my 6 cats. Gus� pal Larry (a ragdoll cat) has given Penny a bit of a hard time and whenever he swipes at her, she just ignores him and leaves. She shows no aggression towards him which of course would make things worse. Larry is finally coming around and I believe at some point he and Penny will begin to play together. I will see you at Goldstock; of course Penny is in the rescue parade and I hope to write you a longer, more detailed email when I get back from Goldstock for you to post at the site. In the meantime, here are a few photos of her. Penny looks great! � thank you for making her so comfortable and part of the family. She� s lucky to have Gus around to help her figure out Larry and the other cats. Hope you both enjoyed Goldstock; please keep those pictures coming!